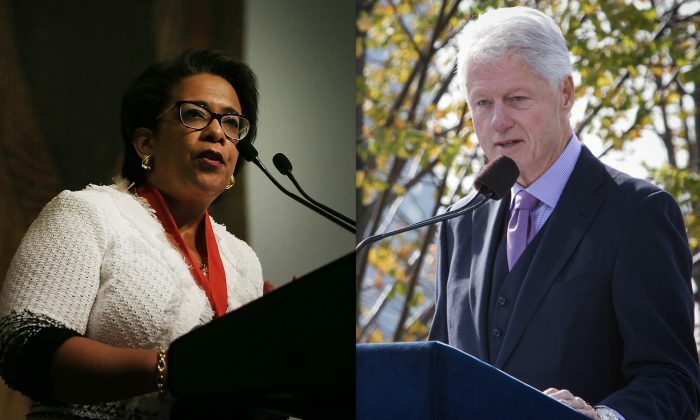 The FBI tried covering up a secret meeting between former President Bill Clinton and former Attorney General Loretta Lynch on June 27, 2016, in Phoenix, Arizona. The meeting took place just six days before former FBI director James Comey cleared Hillary Clinton of charges in her email scandal. During testimony in May, Comey said he believed the tarmac meeting undermined the Justice Department’s credibility on the Clinton email case; and Comey also revealed Lynch directed him to describe the investigation into Clinton as a “matter,” wording that aligned with the Clinton campaign’s framing. Judicial Watch, a conservative, nonpartisan watchdog group, filed freedom of information requests with the FBI and Department of Justice (DOJ) for records on the meeting. The FBI initially claimed there were no records, but after DOJ documents revealed communications on the meeting with the FBI, the FBI agreed to release the documents. On Nov. 29, the FBI provided the 29-page report to Judicial Watch, which the watchdog group published on its website the same day. The documents are mainly emails from after the meeting and reveal that the FBI tried covering up the secret meeting by silencing a whistleblower who had revealed it to the public. The documents show the FBI worked to make sure no more details of the meeting would be revealed to the American people. The “AG” presumably refers to the former attorney general, Lynch. The emails revealed the FBI aimed to punish and silence the alleged police officer, first stating, “We need to find that guy and bring him or her before a supervisor and opr,” and also suggested the bureau should require personnel to sign nondisclosure agreements in the future. The mention of “opr” presumably refers to the Office of Professional Responsibility, which would investigate misconduct by law enforcement. The June 28, 2016, Benghazi report from House Republicans detailed the Sept. 11, 2012, attacks on the U.S. embassy in Libya, which killed Ambassador Chris Stevens, U.S. Foreign Service officer Sean Smith, and CIA contractors Tyrone Woods and Glen Doherty. The incident sparked the investigations into then-Secretary of State Hillary Clinton’s emails.